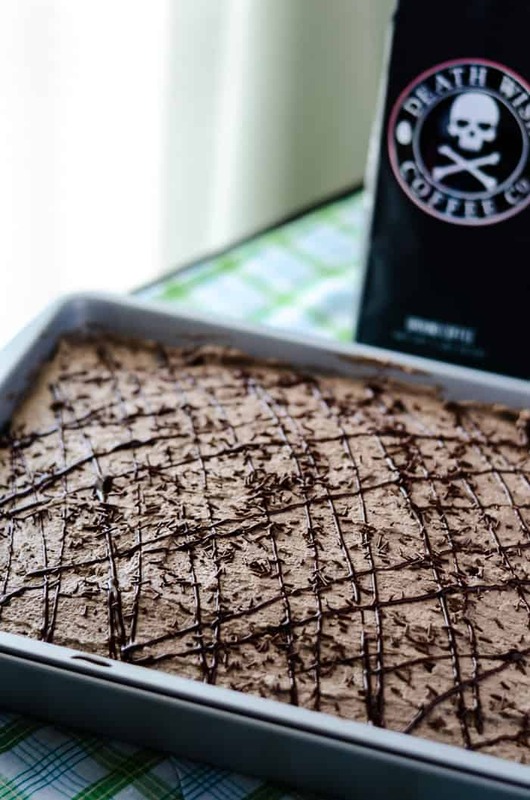 This Death By Mocha Poke Cake is a devilish little chocolate cake, infused and topped with Irish cream, vanilla bean, and the World’s Strongest Coffee! I realize that I started this food blogging thing super late in the game. Had I known I would love sharing my culinary creations so much with you all, I’d have started years ago; but alas, I’m just another one of many, with lots of crazy and delicious ideas brimming in my head and spilling out in to my kitchen and on to your desktop. My blog isn’t yet a year old, and my recipe count is still waaaaay lower than those who have gone before me. But since my brain never shuts off, I have a boatload of content that I’m gonna pack in here over the coming years (yep, I’m gonna stay here, I kinda like this place), so I hope you’ll all bear with me if you’ve heard any of this before! Remember when you were a kid, and your mom (or dad or aunt or grandma) made you a homemade birthday cake every year? It was almost always a single layer and made from a box mix, had quite possibly the sweetest frosting in the world slapped on it with a butter knife, and it was decorated with only a big rainbow-colored number candle. Not Good Housekeeping-worthy, for sure, but still delicious. At least that’s the way I remember my birthday cakes. 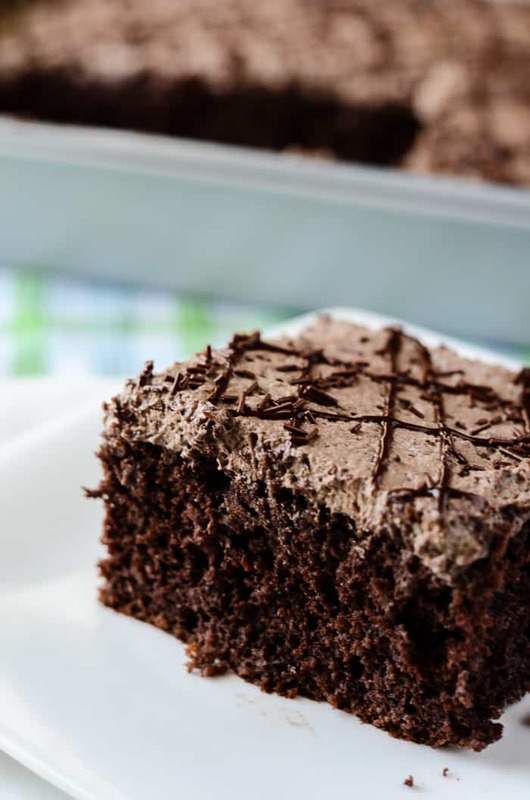 Well, friends, this Death By Mocha Poke Cake…is nothing like those. So, why did I call it Death By Mocha? Because coffee. There is coffee everywhere in this bad boy. 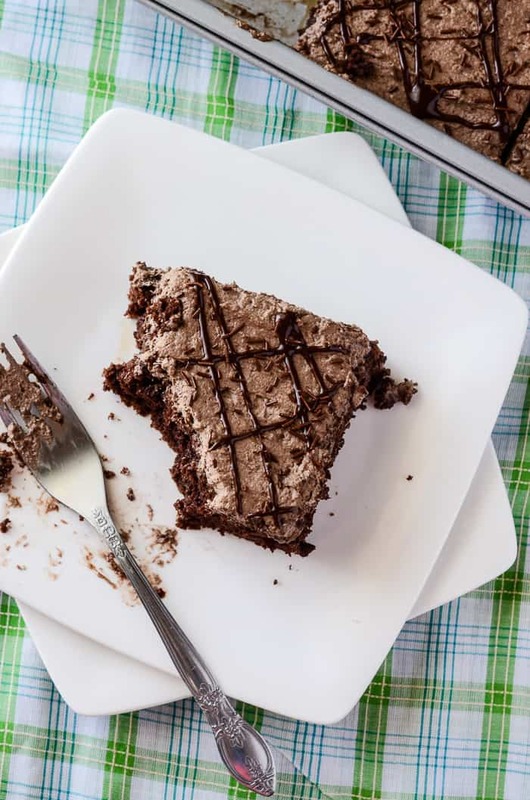 There’s nothing like adding coffee to chocolate cake, folks. You won’t necessarily taste it (although, with almost 3 cups in the whole cake, you should! ), but it really makes the flavor of the chocolate explode! 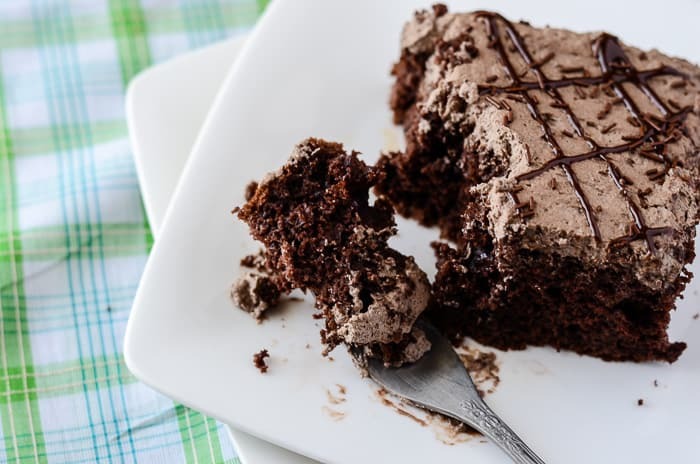 Any time I make chocolate cake, I flip on my Keurig and brew a cup, or turn to my trusty espresso powder. For this particular cake, which was made as a St. Paddy’s Day dessert (hence the Bailey’s I added), I wanted to put my new favorite coffee to good use. The World’s Strongest Coffee, huh? I bet you’re skeptical. I discovered my love for it later than most people, but I’ve had a lot of java in my life. I’m a Dunkin’ and Starbucks freak. I have at least one cup every day, and two to three on my days off work. My Keurig is my second favorite small kitchen appliance, next to my Kitchenaid mixer. If you love your morning cup of coffee with a kick, Death Wish will give it to you. And it absolutely made this beautiful cake. I was in a bit of a rush, so I hijacked my S’mores Cupcake box mix recipe, and swapped out the hot water for hot coffee instead. Then, I drizzled more (sweetened!) coffee on top. Let it all soak in. It may not look like the poke cakes you’re used to pinning, but just because you can’t see it doesn’t mean it’s not there. And topped it with even more (fluffy!) coffee and dark chocolate whipped cream. This thang is a coffee lovers’ dream! Being so infused with coffee…do you think maybe I could get away with just eating it for breakfast? Paired with another cup of coffee of course. This could be the new best part of waking up! A devilish little chocolate cake, infused and topped with Irish cream, vanilla bean, and the World’s Strongest Coffee! Bake for 28-32 minutes, or until a toothpick inserted in the center comes out clean. Remove from oven and allow to cool completely. 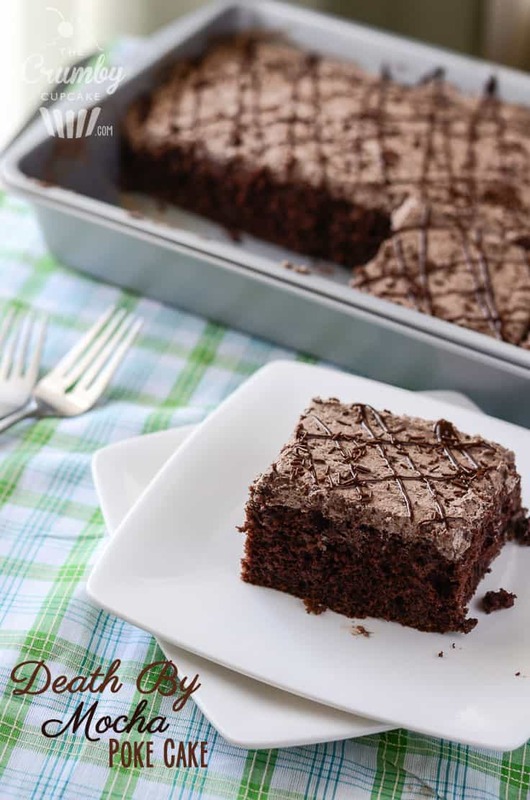 Using a fork, poke holes all along the top of the cooled cake; the more holes, the easier the cake will soak the drizzle. 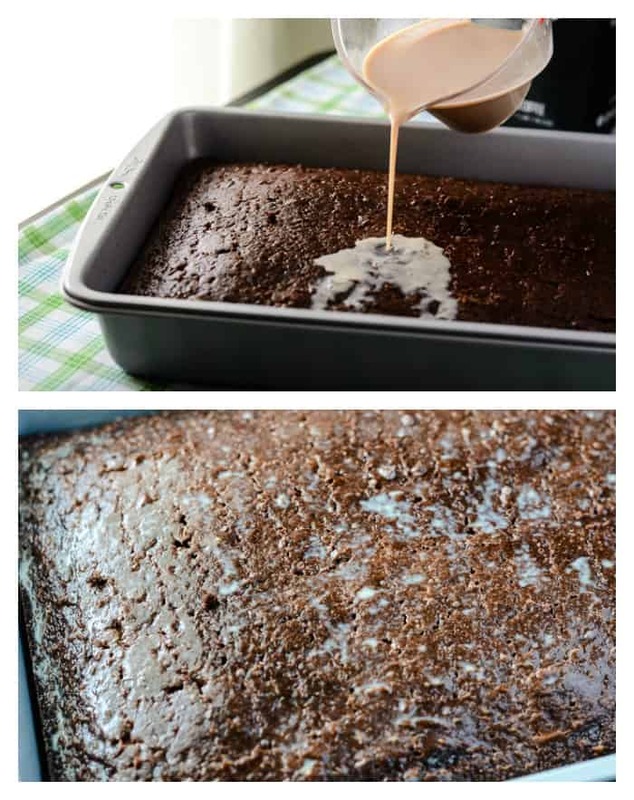 Pour the drizzle evenly across the cake, then refrigerate for 1-2 hours to let liquid absorb. Dissolve coffee grounds in heavy cream for 30-45 minutes. In the well-chilled bowl of a stand mixer fitted with a whisk attachment (or metal bowl and hand mixer), whip coffee/cream until soft peaks form. Beat in vanilla and sugar until stiff peaks form. Spread over the top of the cake, garnish, and enjoy for up to 5 days! Refrigerate any leftovers under plastic wrap. How strong do you like your coffee? Do you use it in your recipes? So we’re already name twins, but I think we’re real life lost twins too, because I cannot think of any better sounding dessert! This looks like absolute bliss. Ok, stop! I just… wow this sounds so good! Poke cakes are one of my favorite desserts. They are so flavorful! And this version just sounds incredible. I can’t wait to make it! Potent! While I love chocolate, I’m still learning to drink coffee. My mom, however would LOVE this dessert and most likely eat the whole pan! OMG. This looks literally to die for amazing. I need someone to make this for me asap! That looks delicious! Would perfect with my coffee! and right now. And anytime! This looks amazing! I’ve never made a poke cake. This looks like a great one to start with! Pinning! This looks incredible!!! As you know, I adore coffee. Especially super strong, dark, sludge like coffee that sticks to your ribs. I despise DD’s, but I’ll drink it if it’s my only option. I would totes eat this for breakfast!!! Oh I bet this is RICH! 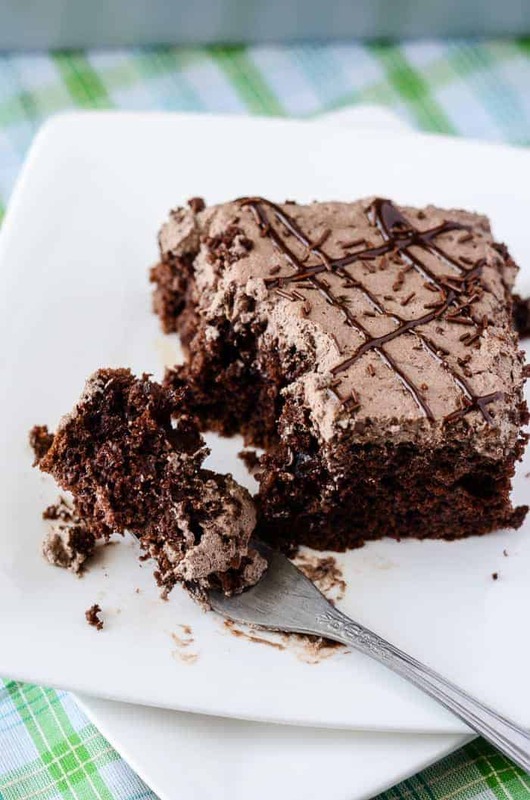 I do love chocolate though… It’s weird, I have NEVER made a poke cake. I’m dead!! LOL. This cake looks so delicious. My husbands favorite is chocolate…chocolate cake. I’m going to save this and make it for him. So. I don’t really ever use coffee in baking, and this post is singlehandedly making me wonder why I don’t. Not only does it sound delicious, but I *know* it brings out the chocolate flavors… and who doesn’t love more chocolate flavor? When I get back on my feet and baking, I’m giving this a shot. And I might just have to track down some of that coffee, too, so that I can see what it’s all about. Thanks for sharing, Erica! Yummy. I am a HUGE fan of mocha. I mean chocolate and coffee. Who wouldn’t like that flavor? This looks great! OMG! No words for how delicious this cake looks! This looks amazing! I always put a little espresso powder in my chocolate cakes because it certainly does make the chocolate stand out 🙂 I actually don’t drink coffee unless I’m heading out for a run, but I recently discovered and fell in love with decaf mochas made with coconut milk. YUM!!! This looks absolutely gorgeous. I love a good poke cake.